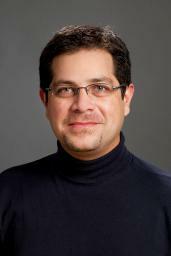 Rubén Proaño earned his Ph.D. degree in Industrial Engineering from the University of Illinois at Urbana-Champaign in 2008. He also holds M.S. (2001) and B.S. (1998) degrees in Industrial Engineering from the University of Illinois at Urbana-Champaign and from Universidad San Francisco de Quito, respectively. Dr. Proaño is also a United World Colleges (UWC) alumnus. In 2008, Dr. Proaño joined the Department of Industrial and Systems Engineering at RIT. He uses mathematical optimization to solve problems that have implications for public policy. His current research focuses on the application of Operations Research to healthcare systems, in particular to the supply chain of vaccines. He enjoys teaching and interacting with students and feels fortunate to have the opportunity to teach Optimization and Logistics courses at RIT. Operations Research, "The Science of Better" (see http://www.scienceofbetter.org/), has an important role to play in, for example, international development. He is a member of INFORMS, IIE, ASEE and TechNet 21. As a hobby, Dr. Proano enjoys soccer. He is a fan of Liga de Quito (LDU), one of the finest South American soccer teams.